Vice President Mike Pence shakes hands with Maine Gov. Paul LePage, left, at a meeting to discuss health care and tax reform in the Eisenhower Executive Office Building on the White House Complex, Friday, Sept. 22, 2017, in Washington. Gov. 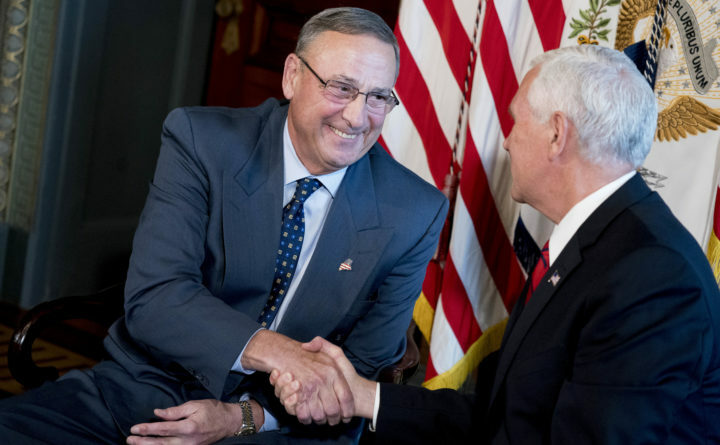 Paul LePage is again trying to persuade Maine voters that expanding the state’s Medicaid program under the Affordable Care Act will spell fiscal ruin. In his latest weekly radio address, released Wednesday, LePage recycles tired claims about the disaster he thinks expanding Medicaid will create in Maine. Question 2 on the Nov. 7 ballot asks voters whether they favor opting into the expansion. It’s a spurious claim. In 2015, the first full year of New Hampshire’s Medicaid expansion, the federal government was paying 100 percent of the costs of expansion-related coverage — so it clearly wasn’t the costs of coverage that contributed to the shortfall. Medicaid-related administrative costs were one of multiple factors that contributed to the Granite State’s budget shortfall that year. But all states, regardless of whether they expanded Medicaid, encountered increased Medicaid administrative expenses as a result of the Affordable Care Act because the law introduced new processes that states had to implement for determining residents’ Medicaid eligibility. Maine spent $850,000 of its own funds — matched by more than $8 million in federal funds — to implement these changes in 2014, despite not expanding Medicaid. “That is going to be taxing on state agencies, for sure, but you can’t get out of that by not doing the expansion,” Stan Dorn, a senior fellow at the Urban Institute who has written several analyses on the Affordable Care Act, told the BDN in 2014. This year, the federal government’s share of expansion funding dropped to 95 percent, so states had to come up with the remaining 5 percent. Based on LePage’s logic, one would expect New Hampshire nursing homes to clamor for a policy that wiped out the expansion. In reality, the exact opposite happened. In late June, nursing home leaders told Democratic Sen. Jeanne Shaheen that Republicans’ Affordable Care Act repeal plans would actually be disastrous. The head of the association that represents New Hampshire nursing homes called the early summer GOP repeal plan “absolutely inhumane” and “a wrecking ball for New Hampshire’s fragile long-term care system,” the New Hampshire Union Leader reported. LePage has been a vocal supporter of Republican proposals to repeal the Affordable Care Act. And he isn’t the only Republican spreading questionable claims about New Hampshire’s Medicaid expansion. Republican Sen. Ron Johnson of Wisconsin in late September sent a letter to Chris Sununu, New Hampshire’s Republican governor, asking him to explain what he characterized as Medicaid expansion costs surging beyond projections. Sununu responded with the analysis of a Wisconsin-based actuary. “The information presented in the Senate letter appears to significantly overstate the growth in New Hampshire’s Medicaid expansion costs from 2014-2015,” read the letter from Milliman actuaries. The firm also pointed out that New Hampshire’s expansion enrollment of 50,000 residents matched the state’s projections. In Maine, about 80,000 low-income parents and adults without children could gain coverage if the state expanded Medicaid coverage. By 2020, the state would be responsible for 10 percent of the costs of covering the largest portion of new enrollees — adults without children who earn no more than 138 percent of the federal poverty level, about $22,000 for a two-person household. An analysis by the Center on Budget and Policy Priorities shows that the majority of those who would be eligible for the expanded coverage live in rural areas, and a majority are working, yet struggling to get by. The Legislature’s nonpartisan Office of Fiscal and Program Review projects that the expansion would bring $525 million into the state every year from federal coffers. The state would ultimately have to spend about $54.5 million from its own coffers, according to the Office of Fiscal and Program Review. That’s about 1.5 percent of a single year of state spending. The $525 million in federal funds would flow to hospitals and health care providers around the state, creating health care jobs and reducing the amount of uncompensated care those health care providers have to provide. Currently, that’s $525 million that the state is turning away. That’s the true fiscal disaster.